Product #20814 | SKU VO4099G | 0.0 (no ratings yet) Thanks for your rating! Designed to clip onto different members of the acoustic guitar family. 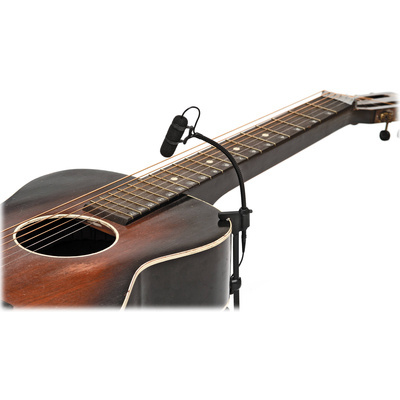 The d:vote 4099G Clip Microphone for Guitars with XLR Adapter from DPA Microphones is designed to clip onto different members of the acoustic guitar family including mandolins, ukuleles, and dobros with a body depth between 1.4 and 4.8". The clip can be adjusted with just one hand and can be used for both live sound and recording purposes. The microphone itself is a supercardioid condenser with a 5.5" adjustable gooseneck for ease in positioning. As the microphone is placed above the strings, it is designed to provide a more natural sound than an internally placed mic or pick-up. The 4099G also features a detachable cable, which allows you to attach your mic to your guitar before connecting it. The 4099G terminates in a Microdot connector, allowing for compatibility with DPA's connection adapters for use with a variety of third party wireless systems. An XLR adapter with a belt clip is included for use in a wired system with 48-volt phantom power.